Strategies for sampling trees for wood density must consider within-tree variations of density; theoretically and empirically developed sampling strategies can lead to accurate estimations of mean density. Wood density is a highly variable functional trait of trees with large differences occurring between species as well as between and within trees of a given species, which is a potential source of uncertainty in forest biomass estimations. Because of the within-tree variation, sampling trees for density in certain locations within the bole (e.g., breast height) can be biased. This study is an attempt to develop and test sampling strategies that yield more representative estimates of whole-tree density by incorporating information on radial and vertical density variations. In this study, 76 trees of 6 tree species from China and Germany were destructively sampled and analyzed for radial and vertical density profiles. The species exhibit different patterns and magnitudes in their density variations. Theoretical approximation points for linear radial and vertical density trends were derived mathematically. The best sampling position was found to be at 1/3 of the tree height and at 2/3 of the radial distance from pith to bark (“strategy 2”). Different sampling strategies as estimators for the mean wood density of the species were simulated, tested and compared. Strategy 2 yielded the best estimates of wood density, while BH (breast height) increment core density at 2/3 radial distance (Wiemann approximation) and BH increment core mean density were slightly less accurate. Sampling-based estimates reduced uncertainty about 5 % relative to database estimates. As a more feasible alternative to strategy 2, adapted sampling strategies based on increment cores at breast height could be developed empirically for the six species. MW wrote the manuscript with help and advice from HS, WG and HC, based on a pilot study done by HC. Data analysis was done by MW based on the work of HC. Field and lab work was mainly carried out by MW and HC with major support from WG. The study was conceived and planned by MW with help and advice from HS and WG. 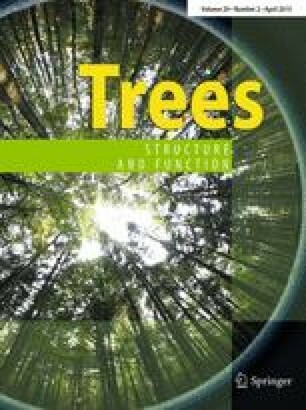 The authors want to thank Ruyao Zhu, Felix Baab and Clemens Koch for their help with lab work, Andreas Dörr and Christopher Morhart for providing stem discs of 35 trees, and Dongjing Sun, Thaiza Pereira, Si Luo, Jan Hackenberg and Stephan Hoffmann for their help with field work. Special thanks go to Shirong Liu, Daoxiong Cai, Burkhard Steckel and Bastian Allmosloechner for making the field work possible. The comments of two anonymous reviewers helped to improve an earlier version of this manuscript. This research was supported by the Federal Ministry of Education and Research (BMBF), Germany, within the Sino-German project Lin2Value (No. 033L049A).